Heavy duty steel mesh with a ½”, 90 ̊ bend at the edges to ensure tensile strength. Tie bar enables two separate pieces of mesh for additional strength. Standard perf: 16-gauge, 3/16” holes, ¼”staggered with 51% open area. strength. 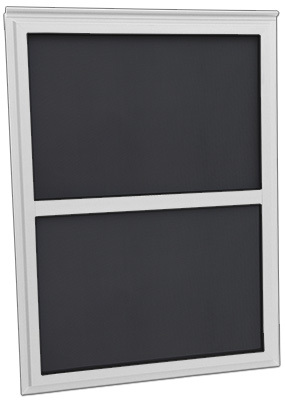 For use with a window air conditioning unit, the bottom section of this screen swings up and is held in place with a metal keeper, allowing normal AC installation.